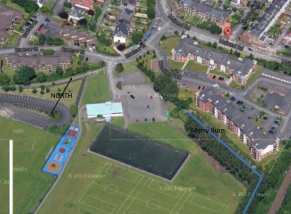 The site is located at Muirend Playing Fields, Giffnock, south west Glasgow. The Merry Burn bounds the eastern and part of the northern perimeter of the site before becoming culverted. The site is currently used as sports and recreation purposes. In the 1950s the site was used for the disposal of waste (particularly chromium bearing wastes), prior to development as playing fields. The Merry Burn along the eastern boundary of the site has historically been affected by the Chromium (VI) contamination leaching from the waste situated beneath the playing fields. To elevate the ongoing contamination of the Merry Burn with highly toxic Chromium (VI), extensive remediation work was carried out in 2003 on the site, including capping of the waste, installation of a new drainage system isolated from the contaminated waste, construction of an up- gradient slurry cut-off wall along the northern, southern and western site boundaries and dredging of the burn. At the time, it was anticipated that while the remediation works would lead to a significant improvement in the quality of the surrounding surface waters – it was acknowledged that some ingress of Chromium (VI) contaminated leachate would continue to occur which it was envisaged would diminish over time. In practice the Chromium (VI) levels in the Merry Burn have not decreased as much as was anticipated and there continues to be some visible discolouration of the Burn. Further site investigation indicated Chromium (VI) waste breaking through into the burn in several location, further works were commissioned with the construction of gabion baskets and peat barriers at key locations to prevent the chromium waste entering the burn. pH analysis of the result leachate was pH11.8 indicting the strong possibility that the waste was highly alkaline chromite ore processing waste. Analysis (by Envirotreat) undertaken of the leachate from the gabion baskets, indicated total chromium levels of 26,000μg/l of which 20,000μg/l was hexavalent (Chromium VI) entering the Burn (EQS for each being 4.7ug/l and 3.4ug/l respectively). Following an options appraisal for the site, Envirotreat were approached in 2014 to provide a E-Clay Permeable Reactive Barrier remediation solution (utilising the recognised ChromeSorb Technology) to further reduce the ongoing contamination issues of the Merry Burn.